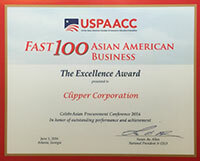 Clipper Corporation has been named by the US Pan Asian American Chamber of Commerce Education Foundation (USPAACC) as one of the country’s Fast 100 Asian American Businesses for its enormous revenue and growth rate. USPAACC’s Fast 100 posted collective annual revenue of $3 Billion, with companies recording up to 44% growth rate. The complete list of winners was unveiled at USPAACC’s CelebrAsian Procurement Conference on June 1-3, 2016 at the Hyatt Regency Atlanta, in downtown Atlanta, Georgia. The Fast 100 represent a wide array of industries, including Advertising & Marketing, Aviation, Aerospace, Architecture, Chemicals, Construction, E-Commerce, Engineering, Electronic products, Financial Services, Facility Management, Food & Beverage, Government Contracting, Healthcare, Hospitality, Information Technology, Industrial Water Purification, Janitorial Cleaning Services, Law Firm, Printing & Publishing, Staffing, Textile Importer, Renewable Energy, Telecommunications, Transportation, Pharmaceutical Distribution, Relocation, Uniforms, and Restaurant Supplies. The Fast 100 winners were of Asian Indian, Chinese, Filipino, Japanese, Korean, Pakistani, Taiwanese, and Vietnamese heritage. CEOs, Presidents and top-level executives of the Fast 100 flew in from all over the country to participate in the Conference and attend the Excellence Awards Reception and Gala on June 1 and the networking reception celebrating the Fast 100 Asian American Businesses on June 2. Founded in 1984 as a national non-profit non-partisan organization, USPAACC has been the single unified voice advocating equal opportunities for Pan Asian Americans in the United States. We promote and propel economic growth by opening doors to business, educational and professional opportunities for Pan Asian Americans and their business partners in major corporations, government at federal, state, and local levels, and small/minority communities. USPAACC serves as the gateway to Pan Asian American suppliers, information about Pan Asian Americans and the dynamic Asia Pacific and Indian Subcontinent markets. Founded in 1994 by award-winning entrepreneur Lina Hu, Clipper Corporation is recognized as a leading global distributor and supplier of professional kitchen accessories and restaurant supplies for national and global chains, including Capital Grille, Denny’s, Yum Brands, Darden Restaurants, California Pizza Kitchen, TGI Fridays, among others. In 2014, Viking – the manufacturer and marketer of premier kitchen appliances worldwide – chose Clipper Corporation to develop and launch this top-tier kitchenware program under an exclusive licensing agreement. Clipper is the sole manufacturer and distributer of the new Viking Culinary collection, with the ultimate goal of maintaining the image and quality that the world has come to associate with the Viking brand. The Viking Culinary collection encompasses cookware, cutlery, tableware, barbecue tools, cutting boards and other non-electric kitchenware.